I have made it abundantly clear how much I admire, respect, and enjoy the music of Coldplay and hyperpretentious frontman, Chris Martin. That was, I did until November 21, 2008 when Prospekt’s March, the accompanying EP to June’s masterful Viva la Vida or Death and All His Friends, was released. This was, coincidentally, just in time for Christmas shoppers the world over to gobble it up like so many Coldplay-hungry termites. Had they heard the drivel that is embodied in every second of the EP, however, they may have gone with the new Britney Spears disc instead. Prospekt is nothing short of a Capitalistic farce, created for the holiday season as a means to package VLVODAAHF with the “bonus edition” stamp. Unlike the latter In Rainbows disc from Radiohead’s 2007 collection, which greatly added to the original short release, Prospekt makes a complete and utter mockery of everything that Coldplay achieved on Viva la Vida. Three of the eight “new” tracks are just alternate takes from the originally released A-sides. There’s clearly a reason that these were scrapped. “Life in Technicolor II” takes the Viva opener, doubles it in length, and adds chintzy and underdeveloped lyrics about Martin’s feet not touching the ground (which he also references in the final Prospekt track “New My Feet Won’t Touch the Ground,” as well as “Strawberry Swing” from Viva). “Lost + (featuring Jay-Z)” is virtually the same as “Lost” on the original disc, but adds a completely displaced, unoriginal, and dynamically static rap from Jay-Z before the guitar solo. Other than that, there is no feature of Jay-Z or remixed hip-hop beat…just a one verse rap about Biggie and Tupac and things that have been rapped about for the last fifteen years. I don’t doubt Jay-Z or his mad skillz, but his performance is a sad attempt by Martin and Parlophone Records to put a prolific name on a song in which it has no place. The final repeater is “Lovers in Japan (Osaka Sun Mix),” in which there is literally no discernible difference between it and its original “Lovers in Japan/Osaka Sun” from Viva save for some background chanting during the choruses. From what I can tell, there was absolutely no earthly reason to put it on a bonus disc that is already decidedly lacking in bonuses. 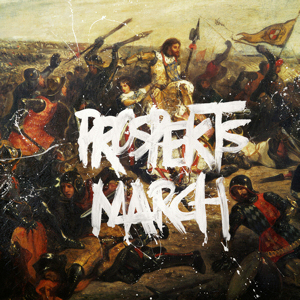 Arguably worse than the repeating tracks, however, are the new songs on Prospekt’s March. All five tracks are simply lesser versions of songs that were written better on Viva la Vida. There is no reason for a slow piano intro and odd-rhythmed chorus in “Glass of Water” (though it is Prospekt’s only redeeming song, if any such thing exists) when you can hear the same art achieved much more effectively and beautifully on Viva‘s “Death And All His Friends.” The other tracks aren’t even worth a mention, as not one of them measures up to even Coldplay’s earliest acoustic work (or James Blunt’s for that matter). Even more than the release itself, I found the very idea of Prospekt’s March as accompaniment to its far superior predecessor to be outright offensive. With Viva la Vida, Coldplay worked hard to prove themselves a band worthy of rock (or at least pop) immortality, but with Prospekt’s March they have undeified themselves and disserviced both their fans and the music loving world as a whole. This EP paves the way for other overpaid, cash hungry bands and record companies to try releasing half-assed B-sides as viable bonus discs when the original itself was more than sufficient for an albumsworth of listening. The fact is that Prospekt’s March was completed during the Viva la Vida sessions, and Coldplay’s record company rightfully decided to scrap those songs. Their ulterior motive, we now know, was to fleece the consuming public into buying an overpriced and underachieved bonus edition of an album that hundreds-of-thousands of gullible preteens and their parents had already purchased when it was worth something back in June. Coldplay owes their fans at least an apology, if not a collective refund, and a promise that in the future they’ll stick to their A-game and leave the B-sides on the cutting room floor. This entry was posted in chris martin, coldplay, jay-z, lost, lovers in japan, prospekt's march, viva la vida, viva la vida or death and all his friends. Bookmark the permalink. >http://www.guardian.co.uk/music/2008/nov/20/chris-martin-coldplay-quitIt may not be true, but I guess it’ll be his excuse for putting out garbage for the next year or so?